My parents host a huge Thanksgiving feast every year. I go up a dress size just thinking about it. In addition to being surrounded by family and friends, what I love most, is the mass spread of traditional fare you only eat once a year (stuffing in July doesn’t sound good to you?!). To keep it fun, we do try to sneak in at least one new dish for the crowd. But it has to be simple, and can’t add to the stress. I posted this recipe on Instagram recently. It happened to be a side dish with dinner and was unexpectedly delicious. All you have to do is slice up the skinny part of the squash (no seeds!) and cut it into half moons. Add a handful of fresh figs, drizzle with olive oil and season. Top with as much sage as you’d like. The flavor is sweet, yet earthy from the herbs, and the figs get all jammy when baked. This simple tray-bake would be a wonderful compliment to your holiday table, especially with the main event: turkey! Oh, and if you can’t find figs, try adding some dried cranberries at the end, so they don’t burn. *Note: this this recipe calls for only ½ butternut squash. Feel free to double up and use the whole thing! Preheat your oven to 425 F. Line a rimed sheet pan with parchment paper. Peel the squash, and slice the skinny neck part into half moon shapes (you can also cut the squash into cubes, if preferred). Add to the sheet pan. Have the figs and arrange them onto the pan, a few cut side up and cut side down. You don't have to use the entire pint, just enough to taste. Roughly chop about 6-8 sage leaves and sprinkle over the top. Drizzle with olive oil to coat, and season with salt and pepper. Toss well to combine. 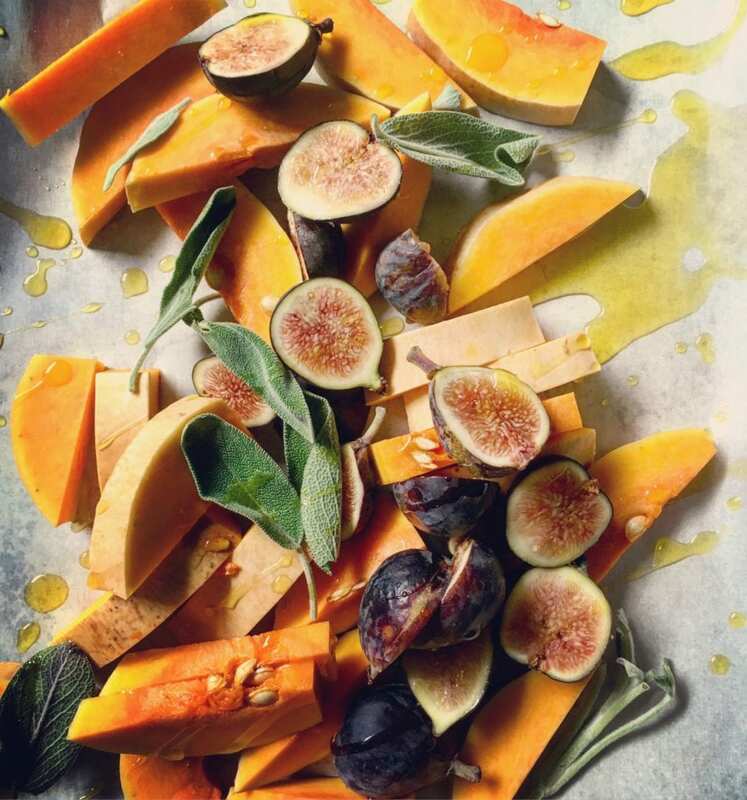 Roast until the squash and figs are caramelized and tender, about 25 minutes, or more. Check on them at the halfway mark to give it a quick stir. I remember seeing this when you posted it on instagram a little while back, and I found myself with a huge squash from the market this morning, so I am definitely adding this to my holiday recipe list. I can’t wait for the combination of sage, squash and jammy figs! Such a wonderful combination. There’s a flush of summer figs in our markets at the moment, so I’m going to give this a try. Thanks for sharing.